Last Sunday the senior footballers travelled to Skibbereen in West Cork and came away with a draw, after winning our first match in the league the management team used the opportunity to make a few changes in personnel for this fixture. In extremely poor wintery conditions Ballincollig played with a very strong wind in the first half, Pa Kelly opened the scoring with a free followed by a delightful point by Kevin Browne. Another point followed soon after when Luke Fahy attacked with pace down the right wing and scored from distance despite the Skibbereen back fouling him in the process. This score extended the lead to three points to one after twenty two minutes. Another good move created the opportunity of another well taken point by Kevin Browne to extend the lead but in the final three minutes of the first half O’Donovan Rossa scored two points to narrow the lead to one point at halftime. Ballincollig opened the scoring from the start of the second half with points from Eoin O’Reilly and Pa Kelly before Skibbereen replied with two hard earned points. With the wind making it very hard to score, Ballincollig now were dominating possession but scoring chances were hard to come by, so when Sean Kiely and Pa Kelly widened the lead to three points with only minutes left it looked like a win was on the cards. With time almost up Skibbereen launched one last attack and broke into our penalty box and forced a shot that was spectacularly saved by our goalkeeper Shane Hogan but unfortunately he could do nothing about the rebound and Skibbereen got the goal that levelled the match. Final score Ballincollig 8pts – O Donovan Rossa 1-05. Best for Ballincollig were Gearoid O Donoghue, Shane Murphy, Colin Moore and JP Murphy. Scorers ; P.Kelly 3pts, K.Browne 2pts, E.O’Reilly, L.Fahy and S.Kiely 1pt each. The 2017 Muskerry awards take place in the beautiful Oriel House Hotel at the weekend. Ballincollig have five players nominated, Brian Cotter in Hurling and in Football, Robbie Bourke, Chris Collins, John Kelly and Gearóid O’Donoghue are all nominated. Enjoy the night and best of luck lads. The draw for the Muskerry U-21 “A” Football Championship has drawn us against Naomi Abán. This match is fixed for Saturday 17th at 3PM in Macroom. The new management team consists of some serious football experience such as Niall Allen and Noel Galvin who are joined by another club legend in Fergal Keohane as a selector. Add the names Jack Gibbons and Colin Moore and you know the management are going to be well prepared. With the exception of Fergal who has previously done great work with our minor footballers, especially last years campaign, this will be a new role in the club for all of them,. We would like to wish the the players and management all the best for the year ahead. Club membership for 2018 is now due and can be paid to Louise Wills, Senior section Registrar. Louise will be at the matches and training so let’s make her job easier and try and pay your membership as soon as possible. When paying your membership be sure to include your phone number and email if you wish to receive text or start a new emails as we are in the process of setting up a completely new text system exclusively for club members. Who wouldn’t like to win over €3,000 !!! The jackpot is now €3,800, tickets are €1.50 for the draw that takes place each Tuesday night. The Club lotto may now be paid by standing order. If you intend on availing of this method please note that you reference your name on the standing order which will be €5 per month payable on 5th day of each month. A.I.B customers can set up manually or on line free of charge. If you are with another bank, please check to see if there is a setting up fee before you proceed. Supporters and players are asked to regularly support the lotto, all the proceeds are used to support all sections of the club. U-21 Football Championship v’s Naomi Abán , Saturday 17th @ 3.PM in Macroom. Senior Football league v’s Clonakilty , Sunday 18th @ 2.30 away. As of yet there are no dates or venues for these matches. All County board and Muskerry league fixtures for every team can now be seen on the club website (BallincolligGAA), reports on our two senior football matches are now available for everyone to read also. Please keep up to date with all club activities on our social media sites Facebook and Twitter. Please follow, share and like these updates when at all possible to help promote our club. Well done to our two players Cian Dorgan and Cian Kiely who were representing Cork in the national football league against Louth on Sunday. The Cork teams are only named on Thursday nights which unfortunately for us is too late to pass on our best wishes in the newsletter . 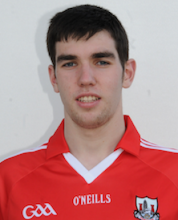 Cork won the match with both our players featuring, special mention for Cian Kiely who scored a goal and a point on his debut, not bad for a wing back ! Both Cian Dorgan and Cian Kiely came through our excellent juvenile set up. It gives great satisfaction to all underage trainers when you see the players that learnt their skills on our pitches then go on to present Cork at the highest level.